Alexandrian Laurel is the common name for this evergreen shrub that is a member of the lily family. Common as a cut foliage component in bouquets- it lasts for weeks in a vase. 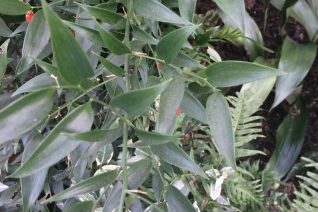 Arching glossy evergreen plant with handsome foliage year round. To 3′ x 5′ wide forming expanding clumps. Tiny flowers transform to showy orange/ red fruits which hold for months on the plant. Part shade to full shade- including the worst dry shade. Regular summer water or very little when established. Moderately slow growing- about 2 new stems per year. Rich to average well drained soil. Great plant for dust dry entryways or under stairwells. Very cold hardy and long lived. Moderate deer resistance.